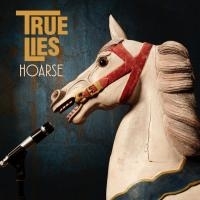 Hoarse is the sixth album from Sweden's True Lies since the debut album Where Are The Angels from 1988. And even it's been over 30 years now, True Lies still make music based on the same kind of ideas as from the very start. It's all about good song writing, dressed up in a classic rock 'n' roll suit. As older and wiser men, they might have a different, slower pace, the sound might be a bit more mature (whatever that is), but the energy, the nerve and the edge is still there.True Lies released their last album, Social D-Day, back in 2010. The songwriters, vocalist Per Olin, guitarists Anders Ragnarsson and Lars Paulstrom, decided in an early stage to raise the bar. No more recordings until they had a full album of songs they could be proud of. Once they had the songs, they entered the studio with the same mindset. No need to hurry anything, let the process take its time. Record, delete, re-record..over and over again...until you're happy.Hoarse turned out just as good as you possibly could hope for. The eleven tracks range from pure power pop in Ronson, edgy rock in Ketchikan Woman and big ballads in Way Down - Hoarse got it all. An album you can listen to intensely. Or open a few cans of beer, crank up the volume and sing along!Hoarse was recorded by Lars Paulstrom and mixed and mastred av Antti Vourenniemi Velaez.Guest appearances by Cicci Landn (vocals) and Mats Bengtsson (piano, organ).